Whether you’re buying cannabis for personal enjoyment or for pain relief, you deserve access to premium products at the most affordable prices. We’re especially concerned about the plight of our medical patients. Medical cannabis isn’t covered by insurance companies, forcing patients to bear the full brunt of the cost. Yeah. That doesn’t seem fair to us either. 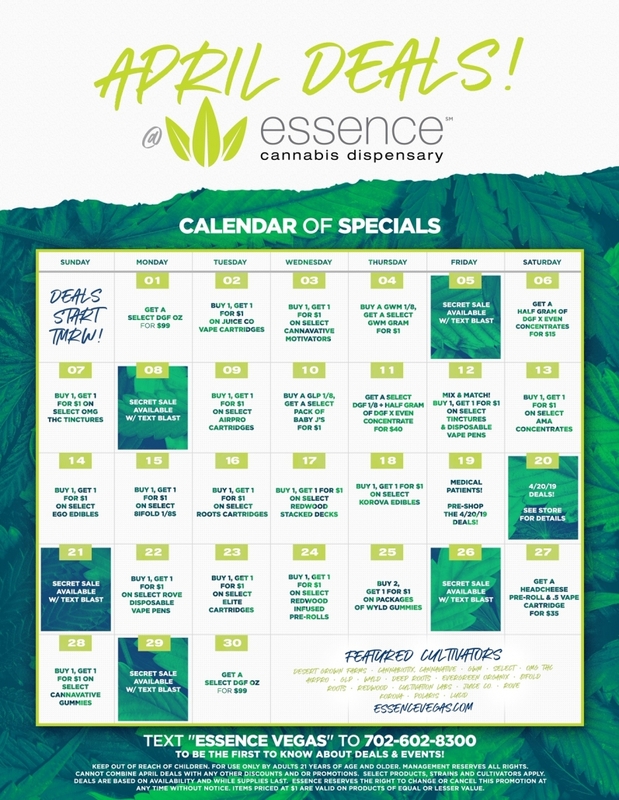 Essence Cannabis Dispensary offers “everyday discount deals” that cover medical patients as well as seniors, veterans, and patients suffering from disabilities. We even offer a special discount for Las Vegas locals! But with this many deals, it can be challenging to keep track of them all. To help you out, we created this handy “everyday discount deal” table which you can see below. Take a minute to look it over, and then take advantage of these special offers by visiting us at any of our three locations! Industry Discount (Medical and Recreational) 15% off For cannabis industry, hotel or nightlife. Must show proof. For cannabis industry, hotel or nightlife. Must show proof. Deals are available at all Locations. Discounts and promotions are subject to change at any time and without notice.